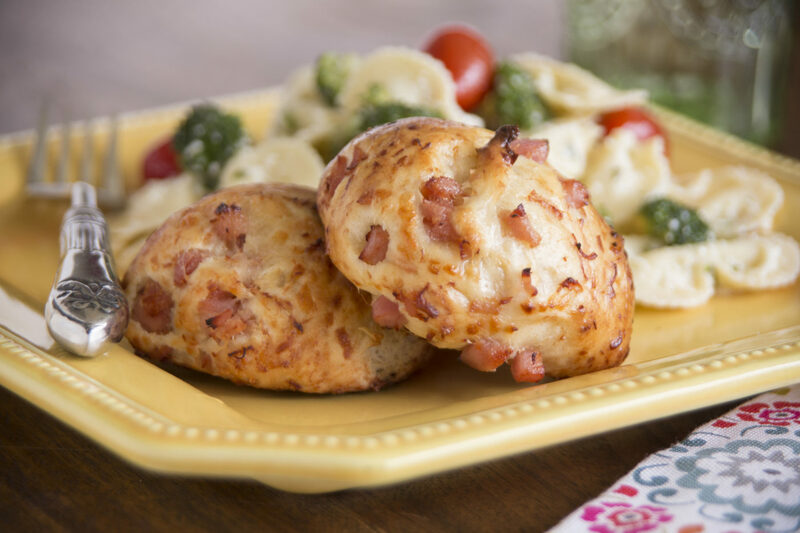 Freshly grated parmesan cheese and diced ham give these easy dinner rolls a delicious kick for a variety of occasions. Place the ham, cheese and salt in a medium sized mixing bowl and stir thoroughly to combine. With a pair of scissors, cut one roll into several small pieces and drop into the ham mixture. Stir to coat all pieces in the mixture. Repeat with remaining rolls, stirring thoroughly after each roll. Once all rolls are cut, knead the mixture with your hands to thoroughly combine the dough with the ham mixture. Divide the mixture into 8 large or 12 smaller pieces and form each piece into a ball. Place on a sprayed baking sheet and cover with sprayed plastic wrap. Let rise until double in size. Remove wrap and bake at 350°F 15-20 minutes or until golden brown. Brush with melted butter while still warm.